Now that the umbrella of "protection" by corrupt officials and law enforcement evaporated once President Trump took office many unscrupulous officials, judges, attorneys, cops, etc. will be investigated and prosecuted . Crooked attorney Malinda Gaul is one such dishonest person. Attorney Malinda Gaul (Bar Card Number: 08239800 ), a national board member of the American Association of University Women- AAUIW and board member of the San Antonio Youth Literacy and the Texas Employment Lawyers Association, is named in documents turned over to the FBI, the DOJ, HUD, the SEC and other agencies for her part in the ongoing RICO-like criminal conspiracy to defraud our Judicial System and to conceal decades of public / police corruption involving many tens of millions of tax dollars. Gaul steadfastly refuses to follow the law , expose the “fraud upon our Courts” and halt the criminal cover-up impacting the well-being of our citizens and the integrity of our Judicial System. Gaul and others will be held accountable for their part in the ONGOING municipal bond fraud scandal ( SEC- FWRO 302036) where "cooked" books have been used for a decade to conceal theft / fraud going back to 1982, the Judicial Fraud in the Bexar County 57th District Court and Federal Court, the falsification of government documents, the theft / fraud involving tens of millions of dollars, the aggravated perjury, the four years of illegal meetings violating the Texas Open Meeting Act, the unconstitutional banning of law-abiding whistle-blowers from public meetings / City Hall and other crimes. Like Gaul, numerous other attorneys who have joined in efforts to hide the illegal cover-up while pretending to be following the law will be brought to justice. The liberal media “black-out” / cover-up will end. Recent criminal acts by Bexar County District Attorney Nico LaHood and others designed to conceal the conspiracy have tolled the statute of limitations once again allowing for current investigations and prosecutions . “ Fraud Upon the Court” has no statute of limitations . Documents, correspondence , transcripts, depositions, recordings, audits, reports, etc. can be seen at CASTROGATE.COM. The “Fraud Upon the Court” chapter exposes Gaul’s criminal acts before the Court while other chapters provide background information. CIO Richard Varn presented additional false testimony stating that it was legal for Department Directors to wander of to the IT Department and pick up millions of dollars to help balance their budgets.....more lies. ......Gaul REFUSED to challenge Varn's false testimony, REFUSED to introduce Varn's deposition into evidence and REFUSED to introduce AD 6.12 as a means to prove Varn's perjured testimony. Gaul has kept Varn's deposition, AD 6,12 and other material evidence hidden for eight years. Gaul and other attorneys concealed the 2007 deposition of CIO Richard varn, Administrative Directive 6.12 and other material evidence from the Court. Judge Antonia Arteaga concealed the document and refused to grant a motion for a new and fair trial. 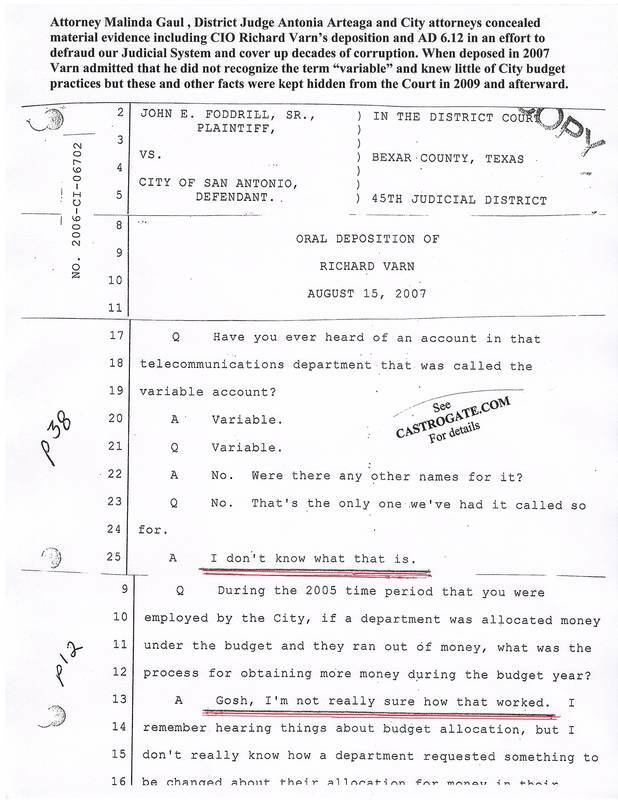 Varn's deposition shows that he knew nothing of the variable billing account or budget procedures BUT that he went on to present false testimony to the Court after ALL attorneys conspired to conceal the document and other material evidence. 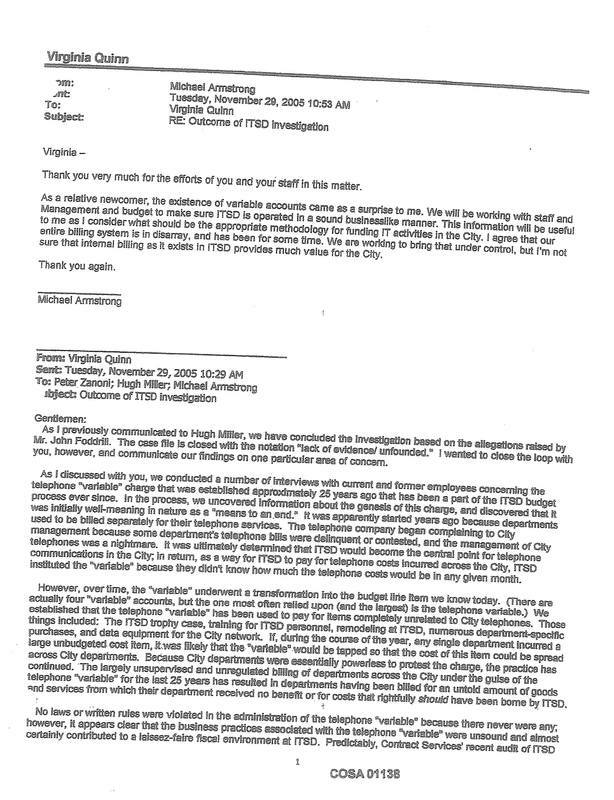 When deposed in 2007 CIO Varn admitted that he knew nothing about how a department would obtain funding if the money ran out during the budget year. 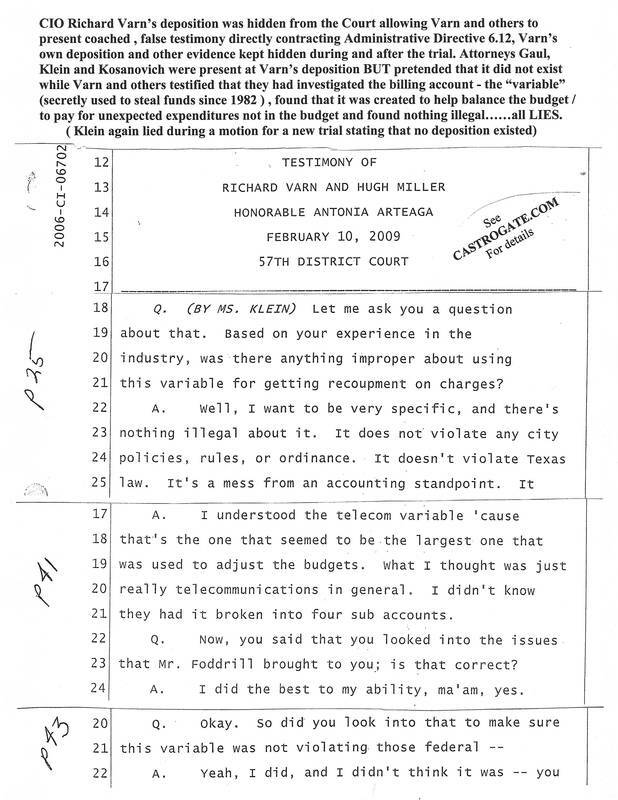 Varn admitted that he knew nothing about an account created for that purpose......In 2009 Gaul and other attorneys concealed Varn's deposition thus allowing him to falsely testify under oath before Judge Antonia Arteaga that he investigated the "variable", found nothing illegal, found that it was created to help balance the budget and to help pay for "pop-up" expenses....all lies. 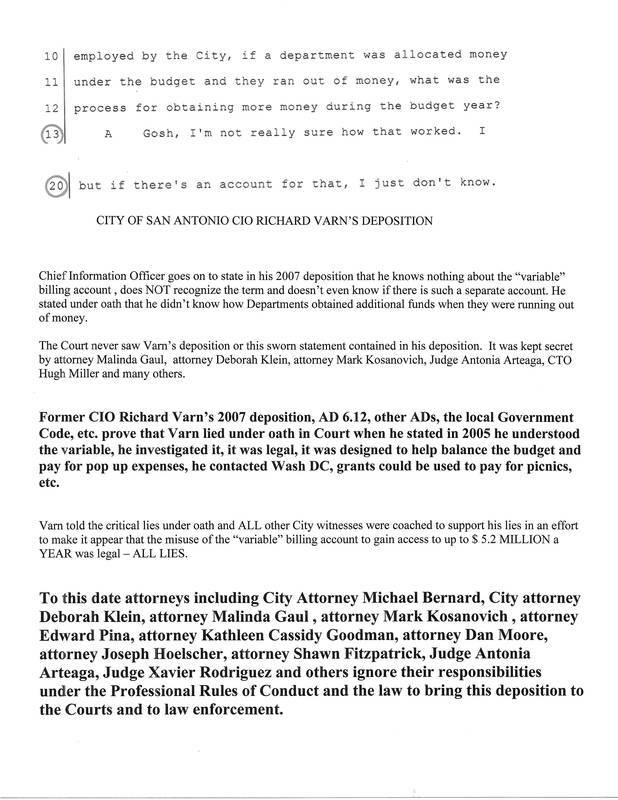 Gaul kept City Administrative Directive 6.12 hidden from the Court thus allowing CIO Varn and others falsely testify that the "variable" billing account was created to help balance the budget, to pay for "pop-up" expenses and to allow Department Directors a means to get funding outside of the budget - all lies...... AD 6.12 shows that the "variable" billing account was created in 1982 to simply consolidate and pay the City's Centrex ( 207 #s) phone bills. 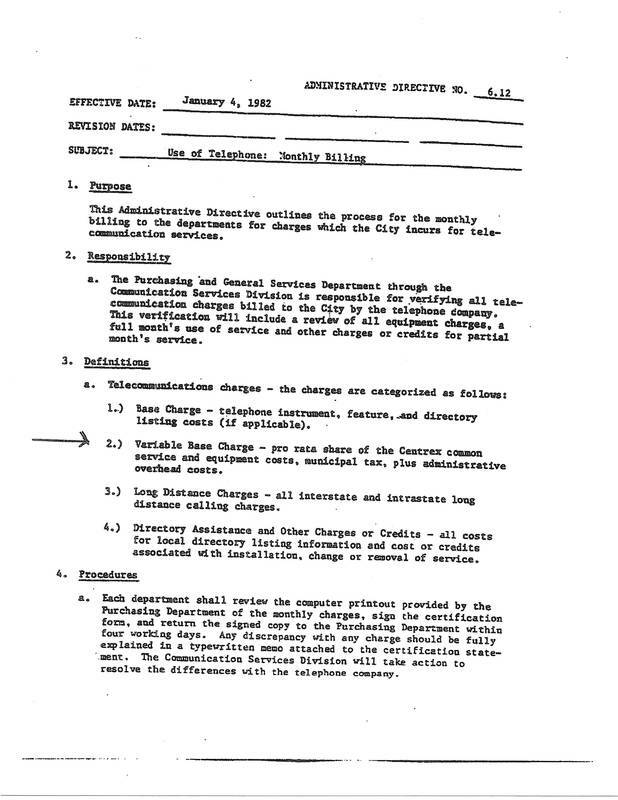 Prior to 1982 each department received their won bill and many times bills were not being paid on time. The Finance Department set up a procedure for the IT Department to pay the bills and charge each department for their fair share of the cost...nothing more. 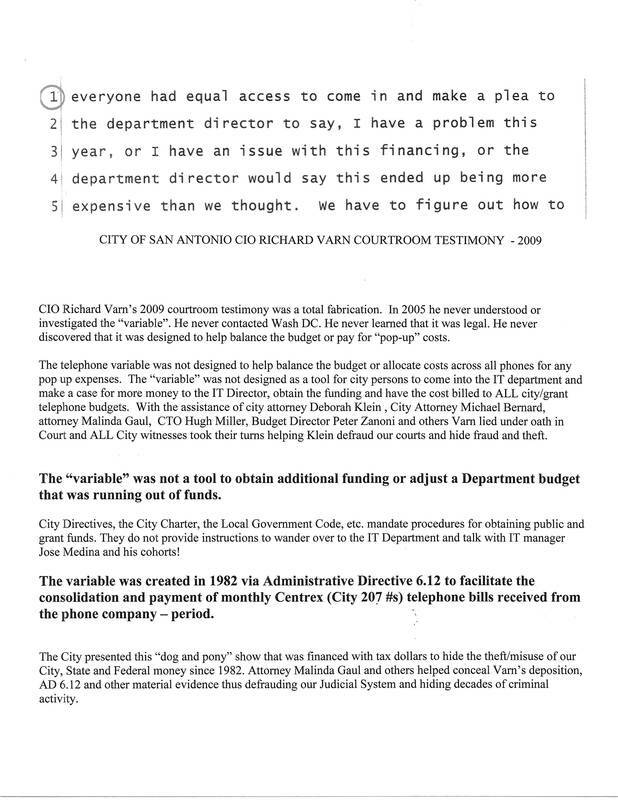 AD 6.12 shows that CIO Varn and others presented known false testimony to the Court when they said that the "variable" was a legal means to get funding outside of the budget, to pay for "pop-up" costs and to adjust department budgets during the fiscal year...all lies. In 2005 CTO Hugh Miller, Budget Director Peter Zanoni, CIO Michael Armstrong , Municipal Integrity Manager Virginia Quinn and others knew that the "variable" telephone billing account was being used to illegally , secretly gain access to millions of dollars BUT kept the criminal activity secret while they conspired to retaliate against whistleblowers and defraud our Judicial System while attorney Malinda Gaul, attorney Mark Kosanovich, attorney Deborah Klein, Judge Antonia Arteaga, CTO Hugh Miller and others presented a " fraud upon our Courts" to conceal the criminal cover-up. 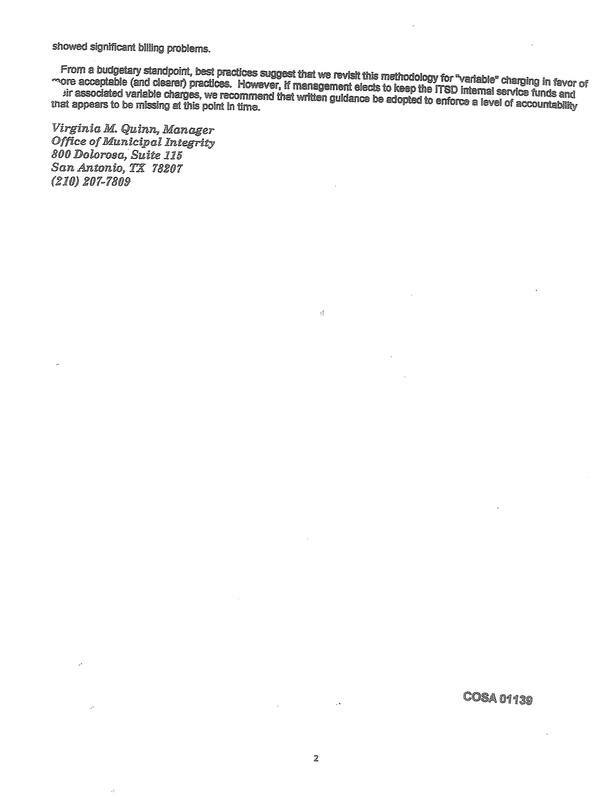 Municipal Integrity Manager Virginia Quinn falsely stated in this email that there were no written procedures pertaining to the "variable" and that no laws were violated....more lies. AD 6.12 was published in 1982 thus creating the "variable" and the internal billing account. It IS illegal to secretly siphon funds from Private, City, County, State and Federal budgets / grants and to use the money for other than its intended purpose and to fuel criminal schemes. Attorney Malinda Gaul (Texas Bar Card Number: 08239800 ), a national board member of the American Association of University Women- AAUIW and board member of the San Antonio Youth Literacy and the Texas Employment Lawyers Association.